A loan of $10,000 helped to increase my inventory, hire an additional employee and develop more active marketing. My name is Abraham. I have been an Electronic Technician for over 10 years now. I am originally from the state of Yucatan, Mexico and have lived in the United States for more than 20 years. During my years here in the United States, I have worked tirelessly to master English, continue my education and raise my son who is now at Pomona College. When my son was 10 years old, in 2007, I had mentioned to him my dream of one day opening my own electronics repair business in San Rafael CA. I studied Computer Information Systems at College of Marin and was exposed to Microsoft Windows Operating System, Mac OS X, Microsoft Office, System peripherals and troubleshooting. Most of my schooling I had to do while I was working two jobs to sustain my family, now I'm absolutely sure that all hard work pays off. 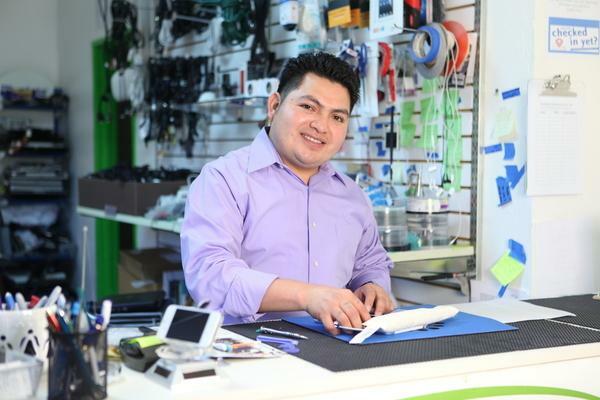 I am happy to say that after planning out the location, the logo, the website, the proper permits, our social media presence, buying tools and equipment, I have finally opened YucaTech Technology Solutions and we are still doing lots of iphones, tablets and computer repairs today, making costumers happy for almost 4 years now. My dream for the future is to expand my business by opening a second branch. but for the moment I would like to expand with a mobile version of YucaTech. It supports a passionate technician looking to provide quality service to his customers. Thank you very much for all your support my family and I truly appreciated! This loan will bring tremendous growth to my business as many of my current customers are constantly asking if we can go fix their iPhone in their offices for added convenience. The loan impact in the business will be huge because I will be able to do all the mentioned additions. My personal life and the lives of my family will also be impacted positively because we will keep our debt ratio to the lowest which will keep tension and stress level of our daily lives low. I thank you very much for all your support and consideration!